23 May 2017 – The first foreign visit of the new French President Emmanuel Macron, after a now habitual trip to Berlin, was to Gao in northern Mali as head of the French military. The visit was an attempt to be seen as paying attention to the efforts of French troops in operations in northern Mali and other states of the Sahel region of Africa. In March 2012, the West African state of Mali was effectively divided into two roughly equal halves, each about the size of France. The northern half was under the control of two rival Touareg groups with additional non-Toureg fighters coming from other Sahel countries and northern Nigeria. The larger Toureg faction was the National Movement for the Liberation of Azawad (MNLA). It was larger than its rivals but less well armed. Its main aim was to create an independent state, to be called Azawad, the name for the area in the Toureg language. The leaders of the MNLA quickly declared the political independence of the area. One Touareg rival was the Ansar Dine “defenders of the faith” which said it wanted to apply Islamic law to all of Mali. In addition to Ansar Dine, there were at least two other Islamist groups, largely composed of non-Malians: Al-Qaida in the Islamic Maghreb (known by its initials in French, AQMI) and Mujao (Movement for Unity and Jihad in West Africa). The complicated tribal politics of northern Mali and neighboring Sahel areas of southern Algeria, Chad, Niger, and Mauritania has made unity of action difficult. On January 10, 2013, with outsized ambitions and poor calculations of international reactions, the Ansar Dine and some related allies decided to move toward Bamako, the capital of Mali. The Malian government cried for help. The French government, which has troops and war planes in neighboring states – all former French colonies – responded on January 11 of 2013 with planes destroying armed trucks, thus stopping the advance of the Islamists. French ground troops were flown to Bamako as a fighting, not only a training, force. The well-trained and equipped French troops moved quickly to take over the cities and larger towns of northern Mali and much of the countryside. The Islamist groups had no desire to fight the more numerous French troops, to which were added Malian forces and small groups of soldiers from other West African countries. Thus, Islamist forces largely melted into the civilian population. Some of the Islamists who were better armed moved north into mountainous areas to live in caves and secluded regions. The Islamists have integrated a northern Sahel area in which there is an active trade in drugs coming from Latin America. Since cargo and persons coming from Latin America directly to Europe are suspected by officials of being involved in the drug trade, an African stopover has become standard. Planes land in little used airports in Mali or other Sahel areas. The drug cargo is taken by road to ports and then shipped to Europe. Along the way, Malian civil administrators and military are paid to look the other way as the drugs go by. Since salaries are low and often paid late, not much additional pressure is needed to move the drugs. Along with drugs, there is an active trade in arms and in transporting people hoping to go to Europe to find work. Looking to the north from Gao and Timbuktu to counter the drug and arms trade has left events to the south in Mali largely unnoticed, though trends there may have even more destabilizing consequences. Due in part to the consequences of drought over the last five years, there has been a push south of the Peuls. (Peul is the single person, Fulani is the correct plural, but putting an s on Peul has become common usage). The Peul, probably some 30 million strong are originally from the Sahel zone cutting across parts of Mauritania, Senegal, Mali, Burkina Faso, Chad, and northern Nigeria. Due in part to the 1972-1983 drought, the Peuls started moving south into southern Nigeria, the Ivory Coast, Cameroon, all the way south to the Central African Republic. Since the Peuls are cattle herders, there have always been conflicts with settled farmers as to when the cattle could come into fields after harvest, the use of water, and so on. In areas where there has been long co-existence, rules have been worked out and dispute settlement mechanisms put into place. With the prolonged drought and new areas of occupation, the old rules and dispute-settlement mechanisms have not been able to cope. 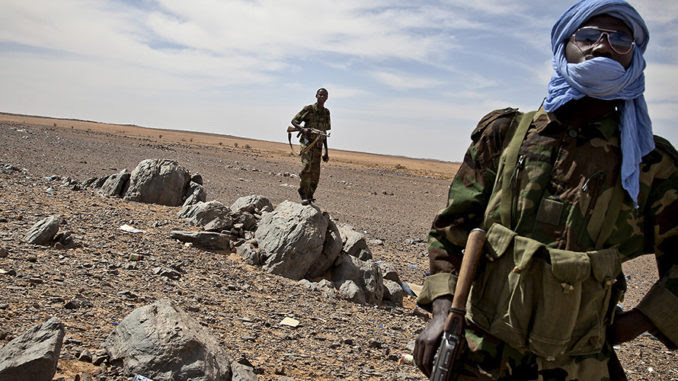 This is one of the factors in the armed conflict in Darfur, Sudan, although the Peuls are not directly there. There seems to be an increasing Islamist current among the Peuls, creating insecurity and tensions both among the Peuls and between the Peuls and other ethnic groups. It is difficult to know from outside what is the place of ideological tensions and what are due to socio-economic tensions and how the two may overlap. Emmanuel Macron’s flash visit to northern Mali – more of a public relations effort than anything – may usefully draw attention to an ever-widening troubled area. This article originally appeared on Transcend Media Service (TMS) on 29 May 2017. Anticopyright: Editorials and articles originated on TMS may be freely reprinted, disseminated, translated and used as background material, provided an acknowledgement and link to the source, TMS: Instability Widens in Mali and the Sahel Region of Africa, is included. Thank you.